A profile of each townland in Killimore parish between 1835 and 1911 has emerged through the study of various documents, publications and maps. Firstly the origins, meanings and different spellings of the name of each townland were explored, and in some cases traced back to the reign of Elizabeth I of England. Other sources used were the Ordnance Survey Name Books, and the Irish Placenames Commission Database. Two eminent local people of the time, Rev. Francis Coghlan P.P. and George D.H. Kirkaldy (Hearnesbrook) had their own particular spelling of some names. Many interesting features were discovered in each townland, most of which, unfortunately, have now disappeared through examining the Ordnance Survey Maps 1838 as well as the Ordnance Survey Name Books. Pre-famine and post-famine census statistics indicate changes in population, while Griffith’s Valuation, 1842-1864, provides a clear picture of the acreage, ownership and occupiers of the land. A clearer picture emerges from the census of 1901 and that of 1911. It is hoped that readers will discover something unique about their own townland. 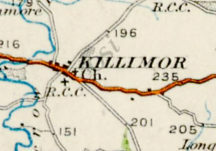 The civil or state parish of Killimor covers nine thousand, two hundred and twenty acres and contains forty six townlands and the town of Killimor.